Confession: Two weeks ago, if you asked me to name the Rose McGowan lasting contribution to pop culture, I’d say that she once dared to wear a garish fishnet “dress” on the red carpet at the 1998 MTV Video Music Awards. Maybe you would answer that she charmed on Charmed. Or another person would note she got killed via an opening garage door in the original Scream in 1996. The End. From afar, she seemed like another former doe-eyed, puffy-lipped ingénue with a long list of obscure credits on her IMDB profile that now directed the occasional short film as a desperate means to hold on to her relevance in an industry that worships youth. I think it’s fair to say we all underestimated her. 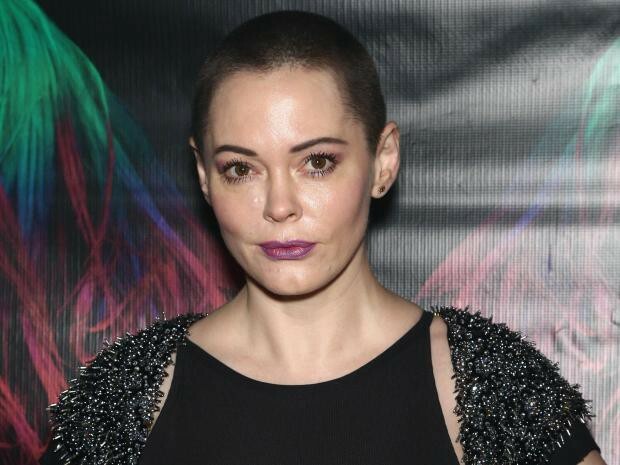 Rose McGowan wasn’t on the fringe trying to be seen. She was trying to be heard. The day The New York Times broke the news about Harvey Weinstein’s harassment charges, she immediately took to her Twitter account and started the fight for justice. As one of the Weinstein’s alleged victims (she says he raped her in his hotel room at the 1997 Sundance Film Festival), she would no longer be silent and be tied to a non-disclosure agreement. She was going to speak up, stand up and, yes, scream. Twenty years of pent-up frustration had finally been unleashed. And a 12-hour Twitter suspension would not stop her. The way she was: McGowan (with Matthew Lillard) in 1996’s Scream. I’ve done a few Google deep dives on McGowan in the past week. The girl who played a horny high-schooler in Scream is now a 44 year-old with a buzzed head. I didn’t realize that her father ran the Italian chapter of the Children of God movement and that she grew up in communes. She got emancipated from her parents age 15. I also forgot she made her film debut in, of all things, Encino Man in 1992. I knew she was engaged to Marilyn Manson but somehow missed that she was also engaged to her Grindhouse director, Robert Rodriguez. Rodriguez and Weinstein collaborated several times. For the past few years, she has been waging a war against sexism in Hollywood and made feminist films. I missed this. Did you know, for example, that in 2015, she called out Adam Sandler and his production company for a posting a casting notice that encouraged female auditioners to dress in a “form-fitting tank that shows off cleavage”? She got fired from her agency for doing this. Her response: “The awesome thing about being an artist? You can’t be fired from your own mind.” I worked at Us at the time and have no recollection of this story beyond a web post. I didn’t bother to follow her on Twitter. She wasn’t A-list enough for me. If there’s power in numbers, that means that a single voice can be an extremely lonely, isolating place. It’s still too soon to see the long-term repercussions of the Weinstein drama. His ouster from the Academy was the necessary move and I suspect we will see many more dominoes start to fall. Personally, I’d love to see an uncensored documentary on the fall of a predatory giant and, more important, the rise of the women that refused to back down. And I know exactly who could direct it.